Note: An advanced reader copy (ARC) was provided by Simon & Schuster. 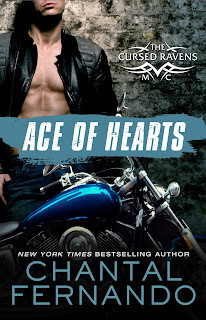 Chantal Fernando's new motorcycle club romance series, Cursed Ravens MC, is finally here and book one is the story of a young woman in search of her biological father and discovers a world unlike anything she's ever experienced before. When twenty-one-year-old Erin Moretti learns that the father she grew up with is actually her stepfather, she demands the truth from her mother. Getting on a bus and then a cab has her standing in front of the clubhouse of the Cursed Ravens, and while she's unsure of the reception she'll receive from the man who played a starring role in creating her, she knows this is something she needs to do. Then she learns that her father isn't just a regular biker but he's the president of the club, which makes Erin a bona fide if reluctant club princess. But club life is different from the life that Erin's been leading in her small town. And while the women in the club don't seem to be all that welcoming, the men appear to be following their president's lead and have welcomed with open arms. However, there's one particular pair of arms Erin wouldn't mind be held by--those of the club's treasurer, Ace, also known as twenty-eight-year-old Carson Kendrick. All the brothers have been warned away by Erin's father, but there's no denying the attraction that sizzles between Erin and Ace. But what kind of future could they even have together? She lives hours away and is determined to go to college, and he's a biker with a manwhore reputation. Their biggest worry, however, is finding whoever's putting the club princess's life in danger. Learn more about Chantal Fernando. Purchase Ace of Hearts on Amazon | B&N | iBooks | Kobo.